To improve the printing experience for users, we have successfully integrated RepairDesk iPad POS Register app with EPSON printer which is the most demanding printer worldwide. To know how to use the printer with our iPad app, please follow the steps below. 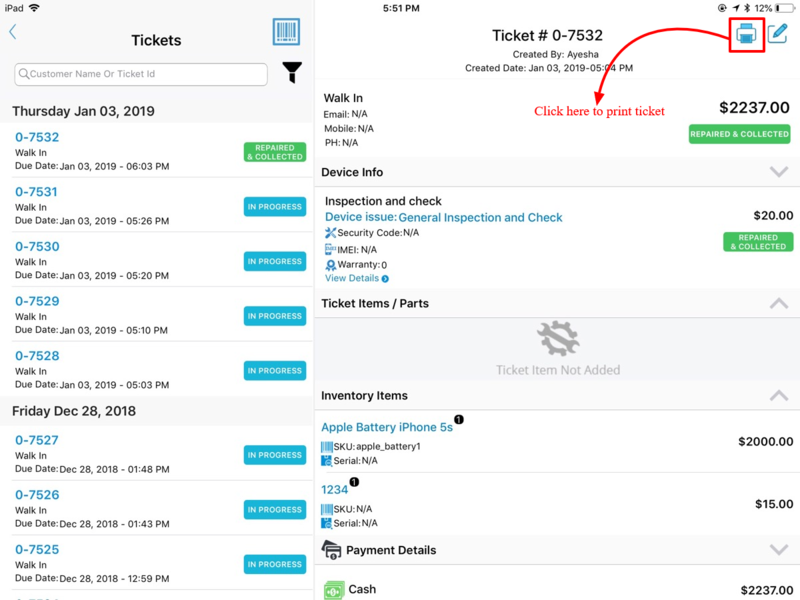 In order to set up your receipt printer with RepairDesk iPad POS Register app, you'll first need to make sure you have all the peripherals needed. Cables: A power cable is required to connect the printer and Ethernet cable is required to plug the printer into internet router. Receipt Rolls: To make printing experience successful, you need to load the receipt roll into the latch by opening top right lid of the printer. Cash Drawer: Setting up cash drawer is optional. If you wish to setup your cash drawer you need to connect it to printer through a cable. Before proceeding with taking prints through EPSON Printer, you need to make sure that printer is connected to your iPad app through same internet connection. Note: If the printer is not connected, then it will display "NONE" against IP Address. In this case, check Ethernet cable connection again with printer and router. Press and hold "push" button to establish connection again. 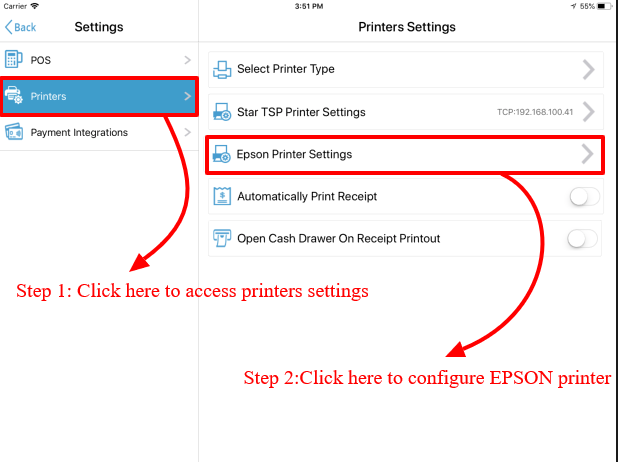 Follow the steps below to take print through EPSON Printer once the connection is established. 1. 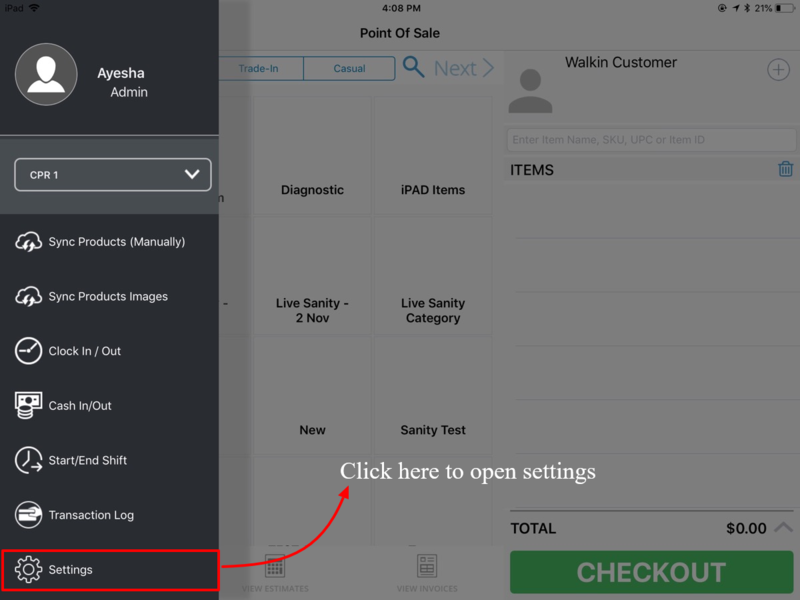 Open RepairDesk iPad POS Register app and head to Settings from left side menu. 2. From settings, select printers and click on EPSON printer to setup the printer. 3. 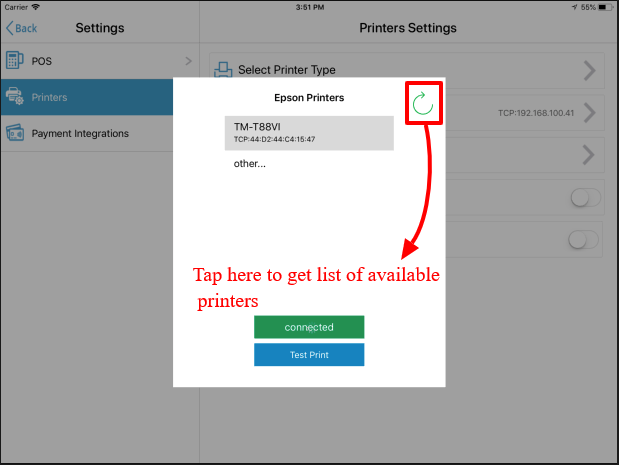 Once you tap on printer settings, following screen will be displayed from where you have to click on refresh button appearing on top right corner of the screen to get the list of available printers. 4. You will get the list of available printers. 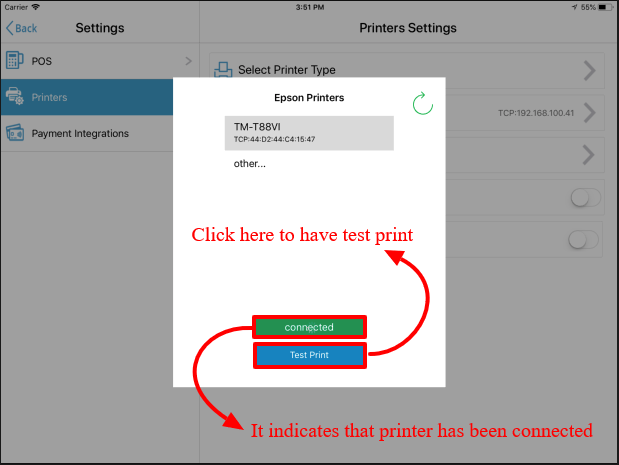 Tap on your required printer and it will show you a button at the bottom of pop-up indicating that printer has been connected. Use Test Print button to have a test print. Q. Can I print already existing invoices, tickets and estimates using EPSON Printer? A. Yes, this process can only be followed for Star TSP printers. To know how to setup Star TSP printer, please follow the link here. A. 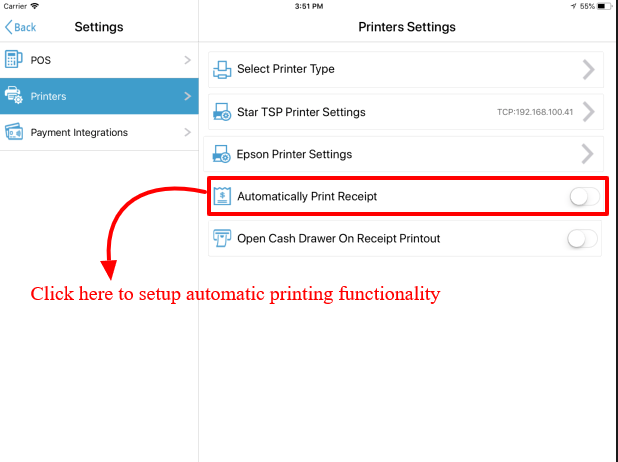 Yes absolutely, EPSON Printer works perfectly with Cash Drawer functionality in RepairDesk iPad POS Register app. Also you can use STAR TSP 100 printer for printing through RepairDesk iPad POS Register app. To know how this printer works, please follow the link here.